Have you found the perfect location for your event but it lacks an inside venue or covered area? 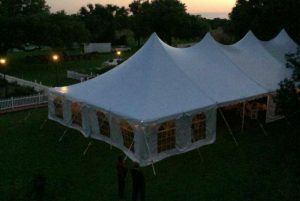 Premier Party Rentals has tents in many sizes. Whether it’s a small family gathering or large corporate event… We have what you need! we have a tent that will suit your needs. Picturing a produce tent? Not with us. Our tents are all high peak designs that are both elegant and eye-catching! By the end of the night, you won’t even remember you’re in a tent in the first place. Three 20×20 frame tents at Florida Polytechnic.